Im definately suffering from seasonal depression! Im SOOOOOO jelous of all my freinds who have gone on vacation! Everyones facebook albums are pictures of them in tropical paradise...Cancun, Cuba, Jamaica, The Dominican, Cabo...Im dropping mad hints to the boyfriend lol! 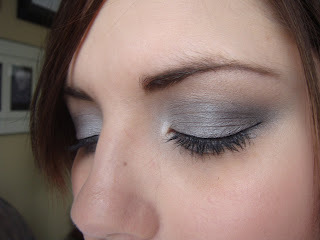 That is what inspired my look yesterday, it was just grey and gloomy out, so I thought Id mimic that with eyeshadow. Im not working right now, I had to quit my job when I got really sick and was in the hospital, and havent bothered finding a new one because were moving the end of March (that blog will come soon). So I havent been doing a whole lot with my time, and now I've found myself in this rut of un-motivation and lack of inspiration! How do you get out of ruts when your in them?? 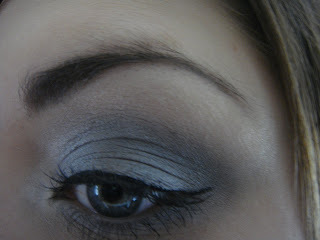 Here are the pics from yesterdays grey day that are up on Temptalia. Im back from my little trip with the BF!! Had sooo much fun at the hockey game!! I actually didnt buy much at all while I was there, makeup or clothes wise...I was pretty dissapointed! I think the fact I was super hung over had something to do with it, I just wasnt into the shopping thing!! But I will post what I did buy soon! How many other are Sephora Beauty Insiders or whatever. I got talked into getting another card for my wallet, but Im curious if anyone has reaped any benefits from it?? Anywho, I got my hair done a few weeks ago, and never took after shots until recently so I thought I would start by posting them! Excuse the stupid faces I am making lol...as well as the roundness of my face...most people dont notice it at all, but its a side affect called 'Moon Face' caused by the medication Im on. Enjoy!! Then a shot with my clip in extensions. I know, I know, Xmas is long gone! But tomorrow Im going to Calgary with the BF for a few days and I will get a chance to hit up a MAC & a Sephora!!! Not only do I get to go makeup shopping but I get to go to my very first NHL Game!!! WOOOOOO! Life really doesnt get much better than that for me!! So this is my little short entry to tell you that Im gone for a few days, but will be back with some pics of a haul and all the looks from the trip!! 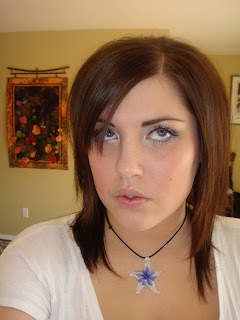 So here I go again starting this blog, after all my past enteries vanished! Thank goodness I didnt have tons of tons of pictures and enteries, but it was something. Im taking it as a chance to have a fresh start!! This is my year of fresh starts I believe!! So I took the time to play around and create a prettyful title graphic for my "new blog" , and now I can start making actual enteries!!! I do (still) have tons of pictures of looks and stuff to post! And a ton of time on my hands to create some new looks and such! This year so far has been pretty crazy, and its turning out to be pretty exciting too! So stay tuned for lots more to come, and I actually mean it this time!!! Im super sarcastic. Im very random. And live my life to the fullest with no regrets!! Im a stereotypical Canadian Girl; I love Hockey (GO FLAMES GO) and the outdoors!! All just as much as I love Makeup and shopping!! Im the kinda girl whos the first on the dance floor, the girl her freinds turn too to do thier hair and makeup, Im the girl who is a hopeless romatic, the girl who can drink beer with the guys! Im newly turned 25, and just trying to get it all together and figure this crazy life out!! !